This camera features the innovative Fairchild Imaging 3041 Sensor that flew on NASA's Deep Impact mission! 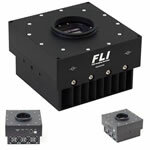 The FLI MicroLine CCD Cameras are known for their superior cooling (to -50 degree C below ambient with air cooling, and -60 degree C with liquid cooling, and their compact size. This model includes a photo-etched stainless-steel 65mm Shutter and single output. 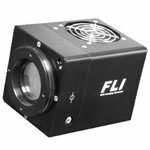 The FLI MicroLine CCD Camera provides heavy weight performance in a 2.8 lbs package. Ideal for X-ray Applications, Astronomical Imaging, Scientific Imaging, Medical Applications, and Forensic Applications. All major components are CNC machined with laser-etched logo, serial number and focal plane indicators. The FLI MicroLine CCD Camera reaches operating temperatures in 5 minutes! Designed and manufactured for a long life in the most demanding conditions, field- serviceable and the sensor is hermetically sealed from dust and moisture. Goodbye Goliath! MicroLine CCD cameras are smaller and lighter-weight than the competition, but outperforms them in key areas such as noise, frame quality, download speeds, bit-depth, and CCD cooling. Fairchild Imaging created the sensor that flew on NASA's Deep Impact mission and captured awesome images of Comet Tempel 1! 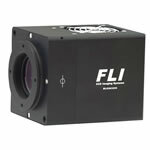 FLI MicroLine CCD cameras feature fast download speeds that simply leave the competition behind. Operating at speeds up to 12 megapixels per second, a KAI-11002 image (full-frame, bin 1) can be downloaded to your PC in just over one second! Each component of the FLI MicroLine camera is designed and manufactured for a long life in the most demanding conditions. All major components are CNC machined and you're looking at only the highest quality electrical components and circuit boards with logo, serial number and focal plane indicators laser-etched on the surface - not printed. FLI designed photo-etched stainless-steel shutters are field- serviceable should they ever encounter damage and the sensor is hermetically sealed from dust and moisture. Now, let's talk about FLI MicroLine CCD Camera Cooling... The FLI MicroLine's robust cooling design achieves a sustainable cooling performance of 50-55 deg C below ambient. The camera��s CCD can be operated at -30 deg C with typical room temperatures and without the need for water cooling or special cooling sequences. Simply set the MicroLine cooling where you want it and the camera will do the rest �C quickly and worry-free. 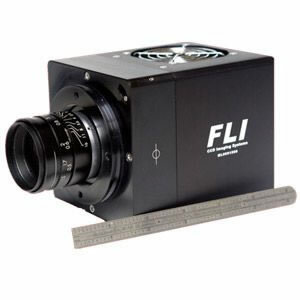 Would you like to know about the FLI MicroLine CCD Camera Internal Frame Buffer? Conventional imaging cameras move the image data directly from the image sensor to the USB port, making them susceptible to added artifacts due to PC processing tasks, processor speed, and other PC-related issues. The MicroLine avoids these issues with its internal frame buffer, thus allowing an image to be quickly read out and downloaded to the PC. This allows the PC to take the image at whatever speed it is capable of without introducing any artifacts to the image. When it comes FLI MicroLine, you get system compatibility and mounting options. The MicroLine line of CCD cameras is compatible with all FLI imaging accessories, including the Precision line of Color Filter Wheels and Digital Focusers. MicroLine camera adapters are available for microscope, telescope and machine vision connectivity. Mounting options include two M5 threaded holes (side), one 1⁄4-20 threaded hole (side), two 1⁄4-20 threaded holes (front), one 2.7" UNS24-2B thread (nose piece) and FLI's standard v-groove nosepiece. CCD readout noise (Sensor and Speed Dependent): As low as 5e~ and anti-blooming available. Anti-Dew Technology (ADT) - Available for all ProLine Systems and MicroLine Systems with the 65mm shutter. In most environments, the temperature of camera window will be above the dew point. In some cases dew may form on the outside of the camera window due to the combination of high humidity, ambient temperature and the window temperature. The ADT corrects this problem, allowing for operation in very humid environments. Liquid Cooling: For applications that require the ultimate in cooling and/or require heat dissipation to occur away from the camera body. All FLI cameras incorporate a fan-assisted TEC (Peltier) that enable the camera to cool the sensor. Temperature reductions of up to 65 Deg C below ambient temperature are possible with the air cooled back. The actual cooling for any given camera will depend on the sensor size and ambient temperatures. The Liquid Cooled option typically improves upon cooling by a additional 5 Deg C to 10 Deg C. The MicroLine Liquid Cooler has a flow rate range of 0.25 to .5 gallon/minute (.94 to 1.89 liter/min).